If you had to choose one place in Spain there’s a clear winner and that city is Barcelona. 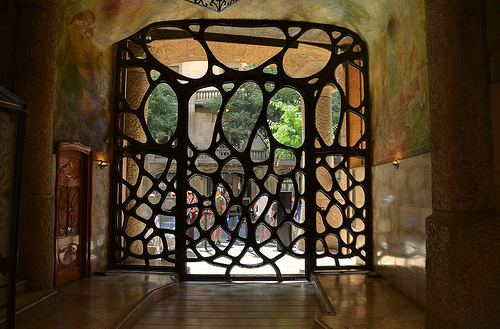 The work of Antoni Gaudí (1852-1926) is a huge draw in Barcelona and rightly so. You need to spend at least one full day visiting the sites designed by the Modernist master. Firstly Park Guell, which is famous for its brightly coloured tile work, Hansel and Gretel like structures and its great views over the city. Gaudi was originally commissioned to take on the project in 1883 and the Catalan architect lived here from 1906 until 1925 – his former residence is now the Gaudi Museum. Our second pick would be the curvy La Pedrera completed in 1910 and located on the Paseo de Gracia which is one of the iconic symbols of Barcelona. 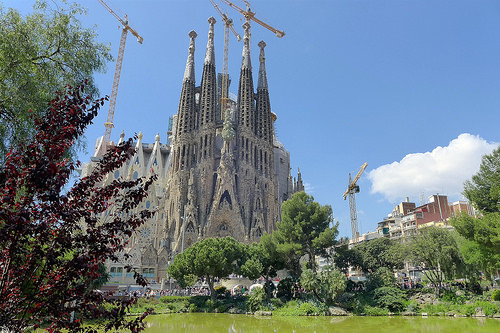 And if you can only see one more Gaudi creation, it has to be the Sagrada Familia, a Christian temple commissioned in 1883 that is still a construction site to this day. Gaudi worked on it fulltime from 1915 and lived on site for a few months until his untimely death in 1926. It is arguably the most famous and spectacular of Gaudí’s works. Those of you looking for a Gaudi-fest could spend a whole week or more as there are many other buildings such as Finca Guell (1887), Casa Vicens (1888), Palau Guell (1890), Casa Calvet (1900), Casa Battlo (1907) and Colonia Guell (1914), and if you want to really backtrack you can see one of Gaudi’s first commissions – the lampposts from 1878 in Plaça Reial and Pla de Palau. But don’t think that Barcelona’s architecture begins and ends with Gaudi. After seeing the main sights such as the world famous Ramblas which is an entertaining avenue full of local colour and the Barri Gotic (Gothic Quarter), where the 13th century Gothic cathedral is situated, you have quite a few more architectural sights. You should see the stunning Palau de la Musica from 1908 by the Barcelona-born architect Lluís Domènech i Montaner (1850-1923) – one of the world’s major concert halls and an excellent example of Catalan modernism. And if you want to appreciate the city’s skyline, we love the views from Montjuic. (We still can’t forget those iconic images of the diving pool during the Barcelona Olympics of 1992.) From Montjuic, you should check out the Palau Nacional by Catalan architect Josep Puig i Cadafalch (1867-1956). It was commissioned for the International Expo of 1929 and is now the home of the Museu Nacional d’Art Catalan. This Spanish Renaissance-inspired structure is well worth a visit for its colossal hall and its collection of medieval art especially its Romanesque frescoes. Montjuic actually means Jewish Mountain – and if you’d like to know more about Jewish architecture and history in Barcelona or anywhere else in Spain – check out our detailed guide here. And no self respecting fan of architecture can be in Barcelona without taking in the Barcelona Pavillion by the German-American architect Mies van der Rohe (1886-1969). The design dates back to the German national pavilion for the 1929 Barcelona International Exhibition and accommodated the reception presided over by King Alfonso XIII of Spain along with the German authorities. After the closure of the Exhibition, the Pavilion was disassembled in 1930 but it was reconstructed in 1986 and is currently celebrating its 30th anniversary. Our final suggestion? The Neo-Mudejar styled Las Arenas Bullring which had been in disuse since 1989. It was converted into a shopping mall by Richard Rogers (1933+) with the Alonso Balaguer Practice in 2011 and it’s a great place for a meal or a drink on your last night in Barcelona. Your next stop must be Madrid. Although it dates back to the 9th century it only became the capital of Spain when Phillip II moved his court from Toledo in 1561. We adore this city’s relaxed atmosphere and where better to experience this than in the city’s outdoor squares such as the Plaza Santa Ana, Plaza Mayor, Plaza de la Villa and the Plaza del Oriente. Today the squares are home to the city’s festivals, fairs, theatre performances, holy week processions, street markets and café-culture. You’ll have to close your eyes and imagine the bullfights, trials and inquisition that took place in, for example, the Plaza Mayor in the past. 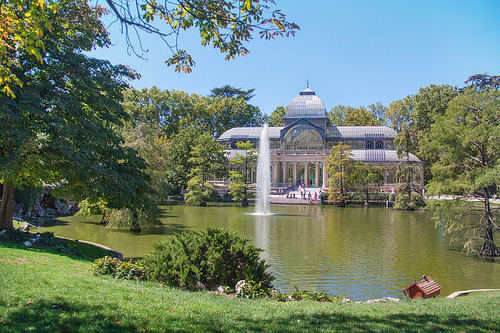 One of our first recommended stops in Madrid is Retiro Park, the capital’s most popular park and a great place to absorb city life. When Phillip II moved his royal entourage to Madrid, he commissioned his architect Juan Bautista de Toledo (1515-1567) to enlarge what had previously been a retreat into a formally laid out park. It would become a centrepiece of Hapsburg life. The gardens passed from royal to public property in 1868. Make sure to seek out Velázquez Palace (1883) and our favourite, the Crystal Palace (1887), both by Ricardo Velázquez Bosco (1843-1923). Exit the park at Puerta de Alcala designed by Francesco Sabatini in 1774. Proceed to the Neo-Classical Cibeles Fountain from 1777 and take in the Palace of Telecommunications aka the Post Office (1907-1919) designed by Antonio Palacios (1874-1945) and Joaquín Otamendi (1874-1960). Hang a left for the Prado Museum – a space dating back to 1785 that houses art from the 12th to the 19th centuries including large permanent collections by Velasquez and Goya. It was first opened to the public in 1819 and was extended in 2007 by Spanish architect Rafael Moneo (1937+). Moneo is a Pritzker Prize winner (1996) and RIBA winner (2003) also. Close your tour of classic Madrid by visiting the Royal Palace which stands on the site of a 9th century alcazar and a former Moorish castle. The Italian architect Giovanni Battista Sacchetti (1690-1764) began the works in 1738 and the building was completed in 1764. Another Italian architect Francesco Sabatini (who designed the Puerta de Alcala) designed the southeast wing and the great staircase. With 3,418 rooms there’s something to represent every style since its completion. There is some debate as to its style – with experts veering between baroque and neo-classical styles. To get a taste of modern Madrid, we recommend the Reina Sofia Museum, home to one of the world’s most prized permanent collections of 20th century art including Picasso’s infamous Guernika. The former 16th century hospital that had been re-designed by Sabatini and José de Hermosillo (1715-1776), re-opened as an art museum in 1986. The conversion was masterminded by Antonio Fernández Alba (1927+), José Luis Iñiguez de Onzoño (1922+), Antonio Vázquez de Castro (1930+) and British architect Ian Ritchie (1947+). A subsequent 8,000 m2 expansion designed by French architect Jean Nouvel (1945+) was opened in 2005. 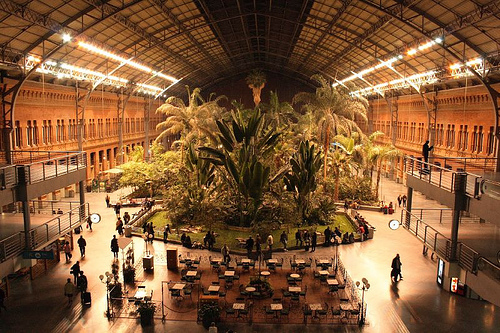 If you’re interested in trains check out the nearby Atocha Train Station which was first opened in 1851 but damage from a fire required a rebuild into what you see today – the wrought iron structure. In 1992, Spanish architect Rafael Moneo completed a significant redesign and expansion which saw the wrought iron building being converted into a concourse with shops and a huge botanical garden. Yes, really, don’t take our word for it. You have to see it for yourself! If you’re looking for a wild card – we’re sure you’ll have an opinion on Platea – the new food court that was an abandoned movie theatre in the Salamanca neighbourhood. Again – an interesting place to wind down in after a few days in Madrid. 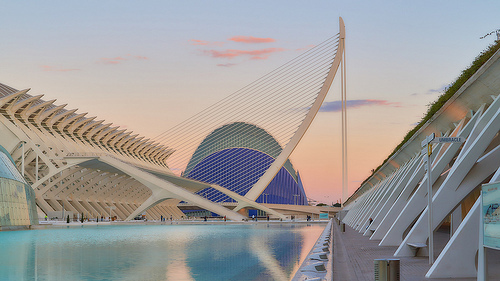 After Barcelona and Madrid, if you can squeeze in another city break, we would factor in a trip to Valencia. Why? You get to lose yourself in the work of Santiago Calatrava (1951+). 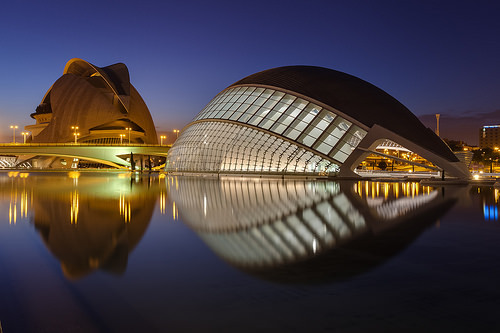 The Valencian architect’s wild and wonderful City of Arts and Sciences is every photographer’s and sci-fi fan’s dream. Words just don’t do this place justice – so we think you should experience the creations with your own eyes. After you’ve blown your mind on Calatrava, you’ve lots more to explore in the city. Start at the nearby Turin Gardens which is a reclaimed space created when the river was diverted away from the city centre following the catastrophic flooding of 1957. It’s a great example of urban planning at its best and this is where you’ll the happiest cyclists, pedestrians, joggers and dog walkers this side of Amsterdam. Valencia’s city centre is a wonderful combination of Gothic, Romanesque and Renaissance and the city’s cathedral by Francisco Baldomar (1440-1480) and Pere Compte (1450-1506) alone offers influences of each of these periods. After visiting the cathedral, make for the staggeringly beautiful 15th century Gothic Silk Exchange also designed by Pere Compte. It is still used for trading today but mainly for buying and selling agricultural products. Don’t forget to check out the new harbour area especially the Veles e Vents structure by British architect David Chipperfield (1953+) and Madrid’s Fermín Vázquez (1951+). Culture vultures and fans of archaeology will want to visit IVAM (1989) – the museum that takes a look at the 20th century art movements and features a large collection by sculptor Julio Gonzalez (Barcelona, 1876 – Paris, 1942). Don’t miss the underground room where you can see Valencia’s mediaeval city wall, which was discovered during the building works for the museum. And although not strictly architectural, if you happen to be in Valencia in mid-March, you should stay for the Las Fallas festival where giant 3D figures made from paper, wax, wood and Styrofoam that are designed and created over the previous 12 months are burned ceremoniously from 15-19 March. Only in Spain! If you’re a fan of markets, you have two treats in store for you in Valencia. 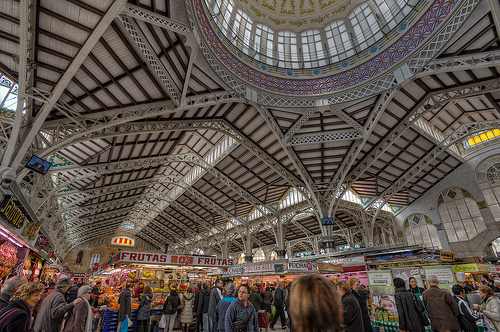 First is the extravagant Art Nouveau building that is the Central Market (1914-1928) which is the handiwork of Alejandro Soler March (1874-1949) and Francisco Guardia Vial (1880-1940). You’ll still find lots of stalls to explore and pick up some tasty bites so you’re advised to visit in the morning when the place is full of shoppers and produce. Afterwards move on to the Modernista-styled Colon Market from 1916. The former market is now more of a mall and is a very pleasant place to stop and have a drink. If you’re there on a Sunday around midday, you might even catch a piano recital! Got another night or two? We love Bilbao’s eclectic mix of buildings and styles. Famed for the Guggenheim effect, the most famous structure in this city is the Guggenheim itself – a 1997 creation by North-American architect Frank O. Gehry (1929+) that is worth spending time in. And remember to set aside lots of time for walking around outside also. We love it for its distinctive titanium curves and soaring glass atrium. In addition to visiting the permanent collection inside that includes Richard Serra’s Snake, you’ll enjoy the temporary exhibitions also. And outside, we adore the Puppy and Tulip sculptures by Jeff Koons and Louise Bourgeois’ Spider outside brings out the kid in everyone also. If you’d like to explore the old part of the city, we recommend walking riverside or taking the marvelous tram with funky grass-lined tracks to the Old Quarter. Keep an eye out for the ironwork and beautiful stained glass at the Santander train station across the river and the Zubi Zuri Bridge by Calatrava. First stop is the newly refurbished Mercado de la Ribera on the edge of the Old Quarter to see how the 1929 structure has been refurbished. Explore the nearby Plaza Nueva meaning New Square that actually dates from 1821 and pick up something sweet from one of the many old pastry shops that have been in business since 1830. Pop into one of the many ambient bars in the Siete Calles for some local white wines and pintxos and then walk back along the riverbank to your hotel. Next day – if you have a good head for heights or like feats of engineering, take the commuter train to Portugalete to see the Puente Colgante – a remarkable Hanging Transporter Bridge built in 1893 and still in use today to cross the River Nervion. On your return to the city centre, take the funicular ride up to Artxanda that affords terrific views of the city. 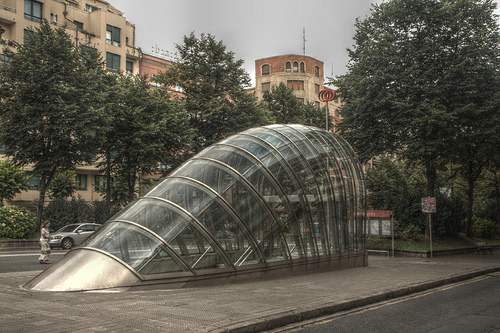 Go back down and check out the Fosteritos on the Gran Via which are Norman Foster’s acclaimed metro entrances. And finally you should visit Bilbao’s newest internationally designed library and cultural space – the Alhondiga (meaning wine warehouse) which was designed by Ricardo Bastida (1879-1953) in 1909 and was re-furbished by Philippe Starck (1949+) in 2010. If you really want to experience this space, we recommend you don your bathing suit and hit the water. When you get there you’ll see why. 5 More Regions or Cities? How you travel depends on where you’re going and how much time you have but if you are planning a trip to just Barcelona, Madrid and Valencia, we recommend Spain’s high-speed train that will shuttle you to these three cities in style. If you add on Bilbao – an internal flight is the solution and you’ll fly into a Santiago Calatrava designed terminal. BTW Many of Spain’s airports are pretty flashy – we love the Richard Rogers (1933+) and Antonio Lamela (1926+) designed Terminal 4 at Madrid’s Adolfo Suarez Airport! Like the sound of Lisbon too? There are great connections from Bilbao, Madrid, Barcelona & Valencia to Lisbon. Is Andalusia’s Moorish architecture calling? Then the high-speed train from Madrid plus a private driver is our top tip. 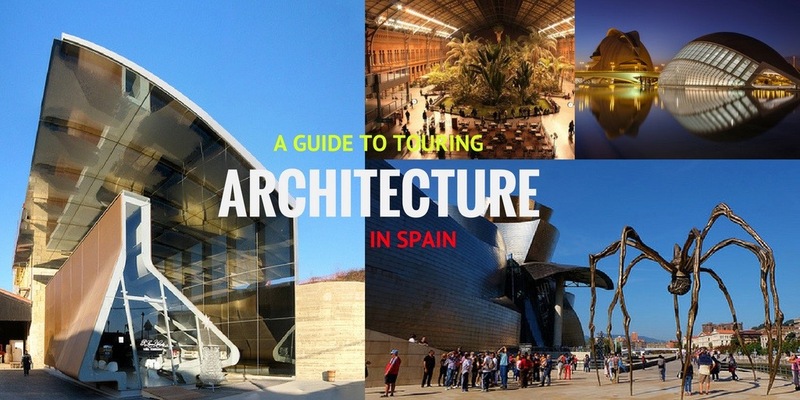 Wherever you decide to visit, we will encourage you to draw on our excellent network of private expert guides including a number of architects who can give you an in-depth architectural overview. It’s true that you can visit these buildings and take the standard tours – but we know that a private tour makes the visit so much more memorable. We love the the local anecdotes and the architectural backstory that our guides offer because they are so familiar with their cities and in tune with their areas of specialism. Of course, it’s not as simple as seeing the sights – as amazing as they are. We like to make sure that you get under the skin of the city. See how it works. We love when our clients can branch out into a residential neighbourhood to see how its inhabitants really live. We’ll pick out a few cafés, squares, parks, tapas bars and perhaps a food market, niche museum, or some other wild card for you to see how people really engage with their locality. If you’re more comfortable doing this on your own – we’ll make it easy to do so. If you’d rather go in the company of a guide – that’s perfect too. Our guides love taking their tours off the beaten path. Got flexibility regarding your travel dates? Why not let us plan your trip to coincide with an Open House weekend in one of the city’s you visit. Take for example Madrid’s OpenHouse which runs in early October – it’s a fantastic way to see the city’s landmarks that even the city’s own residents often don’t get to enjoy. If you can’t make these dates, don’t worry – we’ll try to set up something similar – and there are other events worth considering. 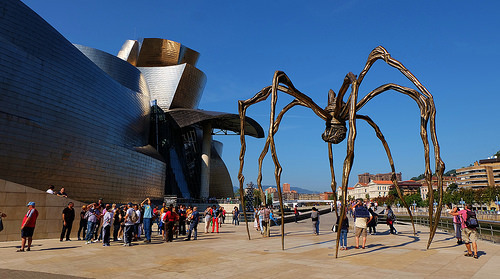 International Museum Day on the 18 May is a great occasion for the museums in Spain to run special events and the Museum Open Night that takes place on the same week is a great opportunity for night visits. Of course some of Spain’s big attractions open at night throughout the Summer – and we love programming client visits when the buildings are perfectly illuminated and you might find live music as well. If you are interested in a particular period of architecture – e.g. Phillip II, Modernist or 20th century conservation, we can programme the perfect trip for you. When we know where you are travelling to, we can come up with some personalised suggestions for you and your travelling party to get around whether that’s walking tours, carriage tours, cycling tours and segway tours. And we can also plan a daytrip or two if you need to get away from the asphalt. We have a number of boutique destinations we love to recommend. Of course, all our clients receive our detailed suggestions for places to eat, relax and shop after a busy morning sightseeing. But we can take it to another level and ensure that every bite you eat is in a location of architectural interest. We can arrange special meals in landmark buildings and drinks at roof-top terrace bars with views over the city’s elegant squares. And for the more understated moments, we can book tables at interesting spots such as Bosco de Lobos inside the Architecture College in Madrid. 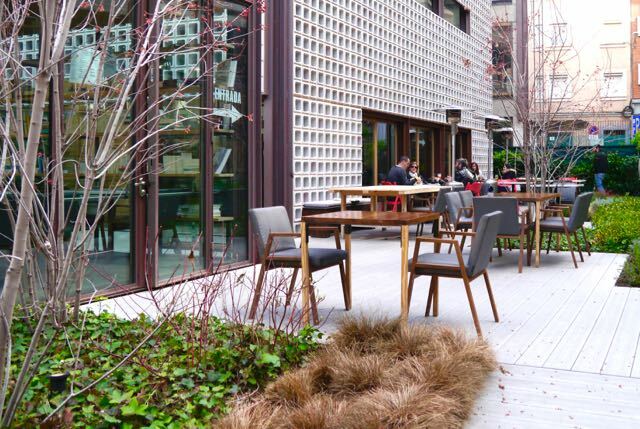 The charming Bosco de Lobos restaurant at the College of Architects in Madrid. And we can do the very same for Barcelona too – how about a meal out at the Cable Car Tower where you have 360 degree views of the city. And a drink or a bite to eat at at the restaurant where Picasso designed the menu and Dali was a regular? In Valencia, we are suckers for a place where Hemingway hung out by the beach. Did you know he loved to write in Valencia? Many of his favourite spots are no longer in operation but there’s one which we like to visit and look at the photos. Sorolla the painter was another fan of the place and he is cited as the reason for the paella del Senyoret – apparently he didn’t like having to peel his prawns! In Bilbao – why not eat at the private dining club that is located in a converted salt warehouse? Or check out the Michelin-starred restaurant attached to the Guggenheim? Wherever you are, we’ll give you lots of tips and will also recommend a gastronomy tour – which is a great way to familiarise yourself with the regional food and wine and get some tips on where to eat while you are there. As you can tell, we are very keen on visiting buildings that have been converted. We love the look of Madrid’s Matadero which is an old slaughterhouse converted into a cultural centre which you can check out in this video. But when it comes to a converted museum in Madrid, you’ll be hard pushed to beat the Reina Sofia especially the Nouvel extension – it’s so hard to imagine the site was a former hospital. 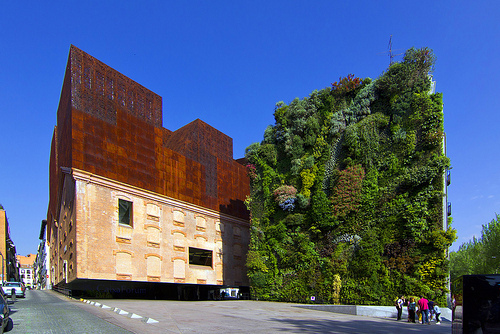 For fans of art and landscaping, you’re going to love the Caixa Forum building in Madrid. This museum and cultural centre was an electrical power plant up until Swiss architects Herzog & de Meuron re-designed the space. Look out for the vertical garden by French botanist Patrick Blanc right beside. Would you like us to come up with great conversion projects in Barcelona, Valencia, Bilbao, Seville, Granada, Cordoba and Lisbon for you? Why not make sure that any shopping and gift purchases are design or architecture driven – whether that’s the bottles of wine you are drinking from or the bar stool you are perched upon. 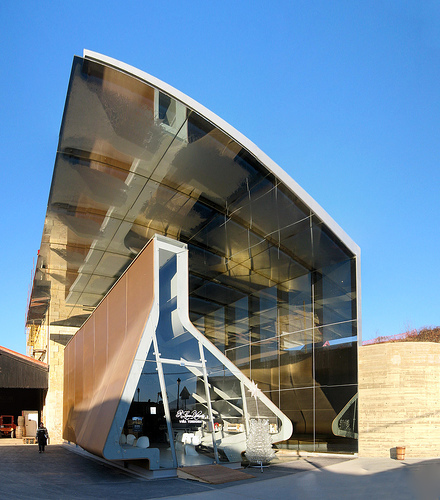 Say, for example that you don’t have time to visit the Marques de Riscal winery hotel designed by Frank O. Gehry or the Zaha Hadid wine store, we can make sure you can at least get to taste the wines in a cool wine-bar in Madrid, Bilbao or Barcelona. We can also make sure you buy your gifts from the design-led stores and can recommend some excellent design-driven places for shopping for gifts in Spain. And sometimes, we might go old-school. You know how crazy we are about Spain’s food markets. We think everybody should shop at these historic spaces to guarantee the spaces and the history continues for another generation. For all of this to happen, you need to have some accommodation in Spain, right? We’ve been booking the best rooms in Spain’s leading hotels for 16 years so you know you can trust us to find the perfect place for you to rest your head. Fancy booking into a modern hotel suite with a view of one of Gaudi’s masterpieces? Or perhaps you’d prefer the quirkiness of a boutique hotel designed by a well-known footwear brand? What about a five-star belle-epoque former palace in Madrid? 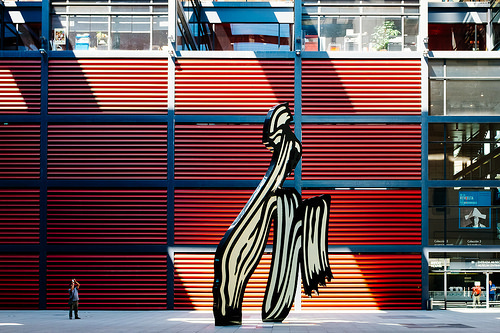 Or maybe you’d prefer a hotel where the Spanish designer Javier Mariscal has made his mark? Wherever you’d fancy, we’ve got stacks of ideas for interesting hotels. Posted in Barcelona, Bilbao, Gaudí, Getting Around, Guggenheim Bilbao, La Rioja, Madrid, Popular Posts, Valencia and tagged Alhondiga, Atocha Train Station, Barcelona Pavillion, Caixa Forum, Casa Battlo, Casa Calvet, Casa Vicens, Central Market, City of Arts and Sciences, Colon Market, Colonia Güell, Crystal Palace, Finca Guell, Fosteritos, Gaudi, Gehry, Guggenheim, Hemingway, Jean Nouvel, Jeff Koons, Josep Puig i Cadafalch, La Pedrera, Las Arenas Bullring, Lluís Domènech i Montaner, Matadero, Mercado de la Ribera, Mies van der Rohe, Modernisme, Modernist, Moorish, Palau de la Musica, Palau Guell, Palau Nacional, Park Guell, Philippe Starck, Platea, Prado Museum, Puente Colgante, Puppy, Rafael Moneo, Reina Sofia Museum, Retiro Park, Richard Rogers, Royal Palace, Sabatini, Sagrada Familia, Santiago Calatrava, Silk Exchange, Turin Gardens, Veles e Vents, Zaha Hadid, Zubi Zuri Bridge.